Our youth network in the Dominican Republic lead a march against corruption. It’s morning in Rome, and commuters are heading to the tube station on their way to work. Today, there’s some special entertainment in store for them – a short video with a catchy tune and a clear message: it’s time to wake up to corruption. 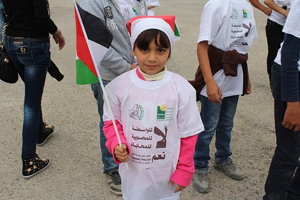 A young participant marks Anti-Corruption Day in Palestine. Her T-shirt reads “no to nepotism”. Meanwhile, thousands of miles away in the Dominican Republic, crowds are forming. People are bearing placards calling on leaders to “stop the abuse of power!” and “jail for the corrupt!” (see image above). Echoing their message, people are on the march in eight cities across Pakistan. Others are filling the streets in Palestine and Yemen (see image on the right). Check the calendar, and the reason for all this activity is clear: it’s International Anti-Corruption Day – 24 hours when we speak up even louder than usual for a world that is fairer, safer and more just. There’s no typical activity for 9 December. In some countries we take our calls to the top – organising high level events where our representatives speak directly with leaders to demand the systemic change that is needed to make corruption a thing of the past. In Moldova, for example, we called for action on conflicts of interest – presenting our new research before an audience of leaders and high-ranking officials, among them the Prime Minister. And in Russia’s Kaliningrad, where we’re investigating corruption cases involving officials, we presented the city mayor and governor with a copy of the criminal code. Other countries celebrate online. In Greece we launched a mobile photo app, and used banners on one of the country’s leading web news portals to share our message. In Bangladesh, our SMS campaign expected to reach 100 million subscribers. 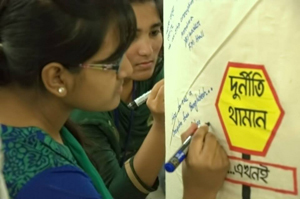 Citizens in Bangladesh make their mark for an independent and effective Anti-Corruption Commission. And others take to the streets for dancing and theatre. Take Haiti for example. After a young hip hop producer turned his anti-corruption message into music, our youth members turned their demonstration into dance – performing live before crowds in the streets. Inviting all involved to tell us why they want to fight corruption, we hung their brightly coloured messages from the branches of trees. Elsewhere we foster new talent – awarding the brightest young filmmakers or illustrators for their creative contribution to the fight for a fairer society. In Azerbaijan we celebrated videobloggers, in Fiji we awarded the best in film and drawings, while in Papua New Guinea we asked citizens to show the impact of corruption through photography. Showing barren wasteland that was supposed to be an airport, the winning entry was just one of many to express public frustration at poor services and wasted money. Yet as the people who joined our anti-corruption march made clear, the country’s citizens are not giving up. Like so many around the world, they want change – and they’re calling for it in ever-growing numbers.